Ajax TOCCO’s electromagnetic field mapping service provides you with important technical information about your induction system. ATM’s field mapping service includes having our certified Service Engineer measure and map the magnetic field around your induction system, and then provide a written report with the results and a plot showing the 2-gauss* perimeter line. 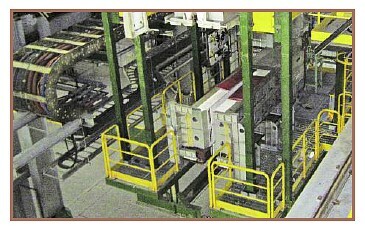 Vertical heating coil in a galvanneal process. 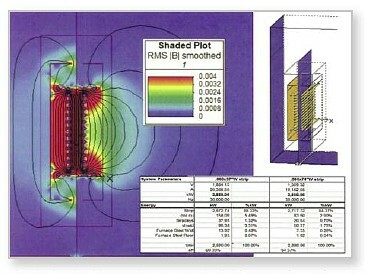 pattern surrounding a vertical heating coil with flux shield. Thermal and vibration analysis service also available. 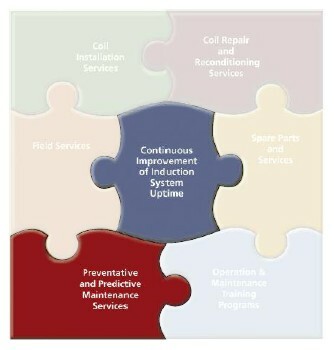 Call System Reliability Services (SRS) today to request a quotation for this or any of our other Scheduled Maintenance Services.